Crinkle cookies are usually made during the holidays, but since Easter has passed, I'm not going to wait for a special occasion to make these cookies! 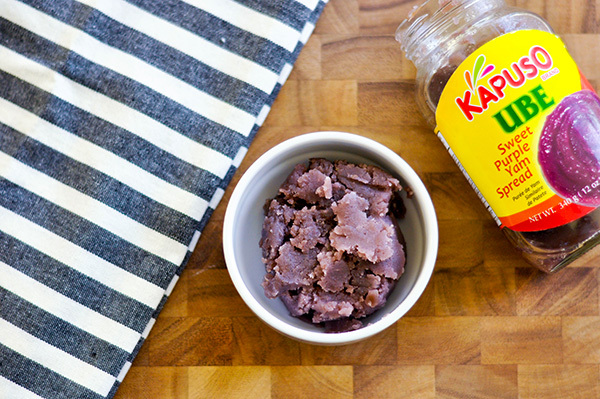 It took me a while to find ube jam, but I think most asian groceries will carry it. It adds to the flavor and texture of these cookies. Plus how cool is it to show up with purple cookies!? These crinkles are simple to make, but do require refrigeration for a couple of hours, so plan accordingly. 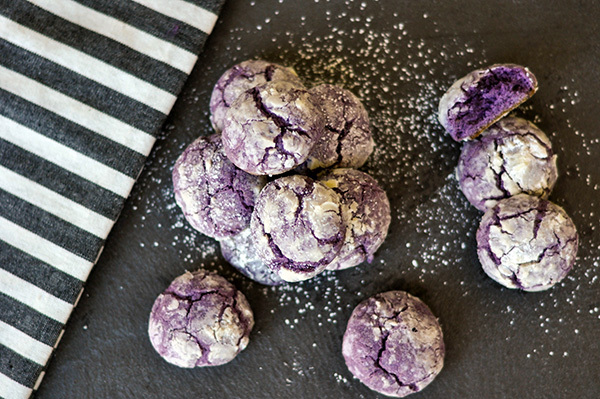 Since the ube jam already has sugar in it, I decided to use salted butter in this recipe in order to help balance out the sweetness of the cookie and the powdered sugar coating. However if you prefer, unsalted butter can definitely be substituted. These cookies start by creaming the butter and sugar. To this comes the ube jam and extract. 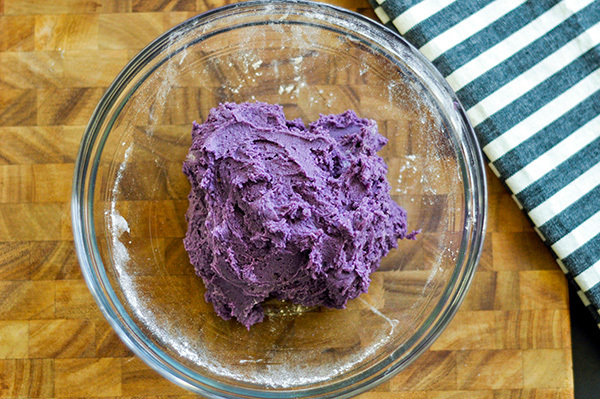 I love how this dough turns into a gorgeous purple color. 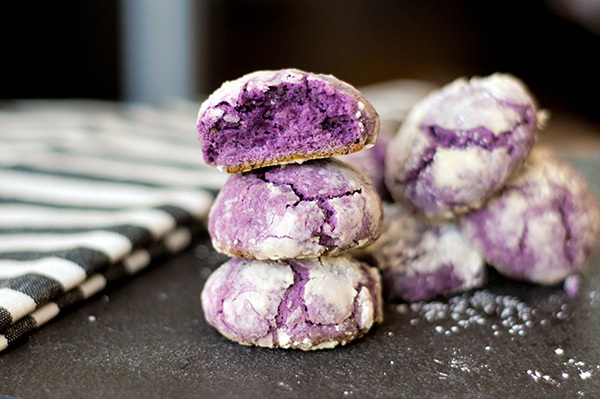 I find that it requires a good amount of ube extract to really give it the flavor you want. So feel free to add another teaspoon. 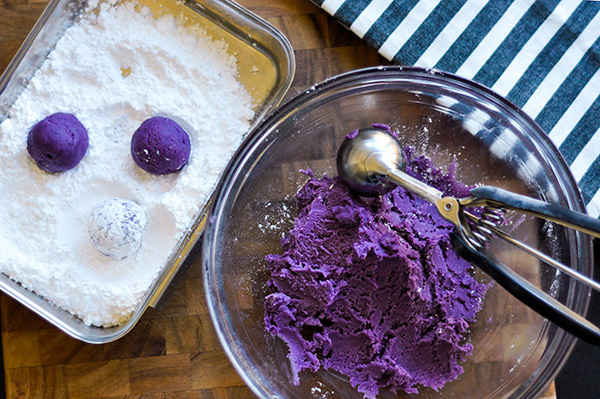 I stuck to 2 teaspoons in this recipe and it gives a subtle ube flavor. Once everything is combined, add in the dry ingredient mixture and slowly turn up the mixer to beat it all together. Cover this dough with plastic wrap and place in the refrigerator for a minimum of 4 hours or overnight. Once chilled roll the dough into golf ball sized balls. I used a medium cookie scoop to help with this. Drop the balls into powdered sugar to coat and place on a parchment lined baking sheet. Bake at 350F for 13-15 minutes. If your cookies are smaller in size you may only need 7-10 minutes in the oven. You'll know when its done when the tops are dry and cracked. Allow to cool slightly on the baking sheet then transfer to a wire rack to cool completely. These cookies are fun and yummy. Let me know what you think and follow me in instagram for more recipes, stories and pics from eating around town! Whisk together the flour, baking powder and salt, set aside. In the bowl of an electric mixer, cream together the butter and sugars. Add the egg and beat until light and fluffy. Mix in the ube jam and use extract. Beat until well combined. Gradually add in the flour mixture and mix well. Cover and refrigerate for minimum 4 hours to overnight. Don't skimp on the chilling time! Roll the chilled dough into small balls. (mine were about the size of a golf ball) Roll in the powdered sugar and place on a parchment lined cookie sheet. Bake for 13-15 minutes. Allow to cool slightly before placing on a cooling rack to cool completely.